Sugar-sand beaches, bronzed beautiful people, and a vibrant nightlife are just a few of the main attractions in Miami Beach. But this city is more than its bright lights and the timeless Art Deco architecture of South Beach — Miami Beach is full of great tourist destinations for visitors and residents alike! Vacation here, or spend the day, there are plenty of exciting attractions for all. And for those with plans for an extended stay, the Go Miami Card offers up to 55% off museums, tours, and activities all over the city. Purchase online or at any of the certified city centers. It would be silly to head to Miami Beach and not actually spend time on the beach. The area is home to some of the most beautiful coastline in the country, so you don't want to miss it. Miami Beach’s beaches offer a great opportunity to exercise, enjoy the sun, or just relax. There are tons of beaches in the area, that offer all types of experiences. For Family fun, try Mid Beach, it’s centrally located and right off the boardwalk. Party-seekers will want to head down to South Beach, while those looking to bare it all will enjoy Haulover Beach. For water sports and surfing try, Hobie Beach. "Where the humans are caged and the monkeys run wild." Monkey Jungle is one of Miami-Dade County’s most unique parks. While homo sapiens walk through carefully constructed wire pathways, over 300 species of primates scamper above your head, swinging through trees and vines, and interacting with each other in ways difficult to observe in captivity. Monkey Jungle is over 30 acres of land and the animals run free throughout the entire area. They are open daily from 9:30 A.M. to 5 P.M. Keep your eyes peeled; you never know who's hanging around! If you have kids (or just like to act like them! ), the Miami Children's Museum is one of the top-rated museums in the area. Their motto, "Play, Learn, Imagine, Create," shines through in the wide variety of interactive exhibits that allow children to explore everything from a bank to a cruise ship, picking up valuable lessons along the way. The museum is open daily from 10 A.M. to 6 P.M. and general admission is $20. Children under a year are free. Formerly known as Parrot Jungle, Miami’s Jungle Island offers visitors a fun and educational opportunity to get an up-close look at over 600 exotic animals including, tropical birds, orangutans, and lions. The park has recently re-opened after a year-long renovation and will now offer many new exhibits. The Aerodium, is an outdoor skydiving simulator and one of the new attractions at the park. Water features, a ropes course, and trampoline zone are also new to Jungle Island. South Beach is the quintessential Miami hot spot. Starting at 1st Street and stretching north till 23rd Street, South Beach is the place to see and be seen. From shopping to partying, this area of Miami Beach is well-known for being the trendy spot for tourists and locals alike. 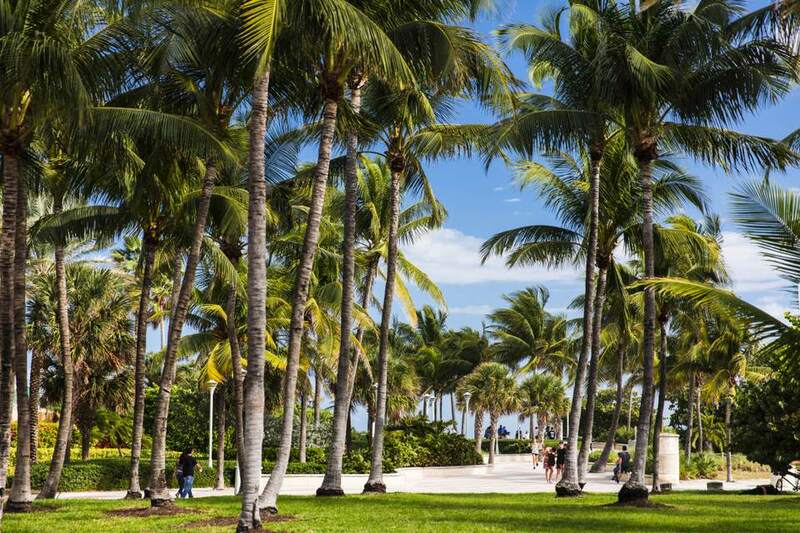 Spend the day down in South Beach taking in the famous art deco architecture or strolling down the famous Ocean Drive. Of course, the actual beaches are beautiful, too. Funky, Lummus Park Beach stretches between 5th and 15th street and is the popular public beachfront in the area. The South Beach beach, is located directed across from Ocean Drive and is known as a celebrity hotspot. Don’t deny it: you’ve seen the celebrities on E! and Access Hollywood, casually sipping drinks and looking oh-so-chic at one South Beach club or another. While you may not actually spot one of those celebrities, (unless you’re willing to shell out big bucks for the VIP rooms), you’ll definitely feel like one partying in Miami Beach. Most of the hottest clubs, like LIV and STORY, are located in and around the South Beach area so head towards Ocean Drive and Collins Avenue to kick off your night. Since the 1920s, Miami Beach has been synonymous with glamour, glitz, and non-stop sun. The epicenter of the beach is really on the barrier island’s south end, which is why South Beach is really what people mean when they refer to Miami Beach. At 17 blocks long and 12 blocks wide, South Beach is a perfect place for a long walk. Plus, there are plenty of cool things to see — from the famous Carlyle Hotel to Gianni Versace’s Casa Casuarina to the Cardozo Hotel, which you’ll probably recognize from some famous Hollywood blockbusters. Tours usually beging at Art Deco Welcome Center, near Lummus Park Beach, and last about an hour or two. Yes, there’s the sugar-sand beaches, the hot clubs, and the beautiful people, but what good would a visit to South Beach be without a day (or two) of shopping? The beach, after all, is the winter home to many a models, fashion designers and rock stars. Which means the shopping is really, really good. From the chain mainstays to tiny, unique boutiques, there’s a store for everyone on Miami Beach. Start off on Lincoln Road — it’s seven blocks of everything you need. And if clothes aren’t your thing, there are plenty of art galleries, jewelry stores, and pet boutiques to peruse as well. Miami Beach is home to some of the world's most exciting restaurants. Celebrity chefs, international specialties, and beautiful views are the hallmark of the Miami Beach dining scene. Plus, the multicultural flavor of the city makes dining here a real treat. From authentic Cuban at El Pescador to Zagat’s top rated restaurant in the area, Joe’s Stone Crab, to Greek, Italian, and Asian fusion — there is a flavor here for everyone. The Ancient Spanish Monastery was originally constructed during the twelfth century in Spain but was bought in 1925 by William Randolph Hearst and transported to the United States, brick by brick. But it wasn’t until 25 years later that they were finally constructed. Today, the Ancient Spanish Monastery is used by the parish Church if St. Bernard de Clairvaux, an active, growing congregation in Southeast Florida. Services are held at the church on Sundays and weekdays but vistors are welcome to tour the grounds most days between 10 A.M. and 4:30 P.M. Admission is $10.00 for adults and $5.00 for children. Spend a day admiring amazing marine life and learning about the oceans at the Miami Seaquarium. This 38-acre marine life park is one of the oldest in the country, and houses more than just marine life. At the Miami Seaquarium, visitors experience penguins, turtles, sea lions, manatees, and tropical birds. Spend the day watching any of the park’s incredible water shows, or get a little more hands on by experiences any of their seven animal encounters, including, swimming with the dolphins, being a trainer for the day, or trekking through a living reef. The seaquarium is a perfect family activity. Sail by some of the most luxurious properties in all of Miami on a millionaire’s row sea cruise. On land, Millionaires Row is considered to be the stretch of Collins Avenue from 41ststreet to 62ndstreet, but not much of these mega-mansions can be seen from the street side. An ocean cruise, on the other hand makes the view way more accessible. Departures are usually on the hour and most tours leave near the Bayside Marketplace. Expect to pay anywhere between $25-$35 for a 90-minute guided tour. Built in the early 1930’s, Stiltsville is one of those Miami-only experiences tourists crave. The collection of homes were built using wood and reinforced concrete stilts that sit about ten feet above the shallows of Biscayne Bay. The homes are located on the sand banks about one mile south of Cape Florida. Although it is not completely agreed upon as to why these homes were built the way they were, most historians will agree that the first Stiltsville home, built by crawfish fisherman, Eddie Walker, was used to facilitate gambling towards the end of the prohibition era. Today, there are seven homes in Stiltsville and are under the care of the Biscayne National Park Service, although each home’s owner is charge of maintaining the property. The Miami Beach Botanical Gardens is a 2.6-acre greenspace right in the middle of the city. They feature many subtropical plants from all over the world in addition to many native Florida species. Admission is free unless there is a special event, and the gardens are open Tuesday thru Sunday 9 A.M. to 5 P.M.
Another great way to experience Miami Beach is on a speedboat tour. Nothing says Miami Vice like a 50mph catamaran ride around Biscayne Bay. Thriller Speedboat Adventures has been running tours for over 10 years and offer tours of Stiltsville as well. Speedboat tours are usually narrated and can last anywhere from 45 minutes to an hour and half. Expect to pay about $40 per person. Take a break from tanning at the beach and experience the party side of Miami at one of South Beach’s many daily pool parties. Most hotels in the area, like Dream South Beach, Mondrian South Beach, and the Cleavelander, open their pools for the public and offer some amazing parties. Expect to find DJ’s, open bar options, and lots of good looking people. Admission can cost upwards of $30 plus drinks so be sure to find out what’s included before heading inside. Formally the home of businessman James Deering, of Deering McCormick-International Harvester — the famed manufacturer of agricultural machinery and construction equipment, the Vizcaya Mansion is a site to be seen. Today the estate is purely used as a museum and event space. Visitors can tour the over 50 rooms and enjoy the many courtyards and gardens. The museum is open Wednesday thru Monday from 9:30 A.M. to 4:30 P.M. Admission is $18 for adults and $6 for children up to age 12. The Phillip and Patricia Frost Museum of Science includes over six hands-on exhibits, a planetarium show, and a three-level aquarium all for the cost of one admission. This museum is a great family-friendly activity that all ages will enjoy. Learn about the inner workings of the body at MeLab, an interactive exhibit that teaches all about how our bodies and minds function. Learn about the importance of water conservation at H2O Today, part of the Smithsonian’s Think Water Initiative. The museum is open daily from 9:30 A.M. to 5:30 P.M. While enjoying the beautiful beaches of Miami, be sure to take advantage of all the amazing water sports abound. From jet-skiing to parasailing, the beaches of Miami are filled with water sport retailers and awesome water activities. You can find almost any watersport in the area but one new activity that’s been gaining popularity among beachgoers is LED sunset paddle boarding. The boards are equipped with LED lights that illuminate up to 15 feet below the water which make for a rather picturesque moment. The tour leaves at sunset and is available through Miami Beach Paddle Board and are about $65 per person. Miami’s flagship contemporariy art museum is a great place for kids and adults. The Perez Art Museum Miami, PAMM, has an ever-revolving door of unique exhibits from artists all over the world. PAMM Kids, is a unique program offered at the museum meant to engage younger guests. The program includes family packs, activity booklets, an interactive museum app, and a unique dining experience at the Verde Museum Café. Inquire at the service desk for family packs and activity booklets. The museum is open every day but Wednesdays from 10 A.M. to 6 P.M. and pm Thursday till 9 P.M. Admission is $16 for adults and $12 for youth, students, and seniors.